Printer Canon MP258 printer is a type that is used as a print image or photo can also be used to scan and copy photos and files, so no need to go out of the House/Office to photo copy paper with the printer you can reproduce the writing/drawing. you need to know is the Printer can not print, scan or photo copy in the form of paper A3, if forced then only some can scan/copy. Now many printers that have been modified in order to make the content more and save money in purchasing the ink cartridge with a pretty expensive with a price of around IDR. 200,000 then the existence of the ink catridge modifications aside, the use of more and rarely to replenish the ink bottle because too big of a cartridge. The price of the ink that is not original were classified as cheap to bottle, the price is around IDR. 30,000 for bottle and around IDR. 50,000 for a rather large size bottle that every brand has its own clear price benchmark rates each brand is not the same. Sometimes problems occur while using a modified one ink printer canon MP258 show ink depleted but in fact the ink on cartridge still a lot, this due to the the printer has its own size every 1 cartridge can print up to the paper and the ink has run out when considered over the limit. 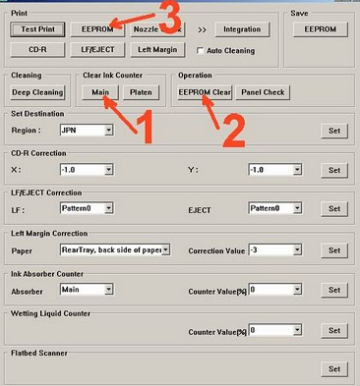 To fix the issue, you need to reset the Printer so that the ink counter MP258 on default software application can again assume the cartridge has been full and can be reused as readily. Early indications when the printer is turned on will show the Error MP258 P 07 in LCD Panel. Then click the "EEPROM" and the printer will print the result resetter MP258. One of the row following his "TPAGE (TTL = Copy = 00000 00000)"